It's starting to get a little cooler, and the leaves are changing. You know what that means? The best autumn beverage will soon be available everywhere. No, not pumpkin spice! It's apple cider time! We can throw back all that delicious, tangy apple juice — or the hard, drier version — in drinks, breads, cakes, candles, and more. 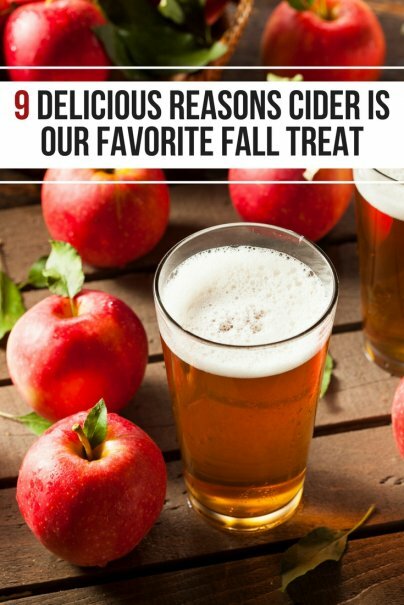 Here are just a few of the reasons cider season is our favorite time of year. Cider starts to get cheap this time of year. I can usually buy all that I need for a week or so for under $10 at my grocery store — depending on the brand I want and whether there's anything special about it (organic, already spiced, flavor infused, etc.). But one of my favorite parts of cider season is making it myself. Hard cider is truly one of the joys of my life, year-round. I'll be honest, making this is a much bigger commitment than making regular cider. But if you have access to some beer-making supplies (usually a demijohn, a rubber stopper, an airlock, and a siphon hose), it's actually one of the easiest brewing projects out there. There are as many recipes for hard cider as there are cider makers, but this hard cider recipe is one of my favorites. I love that it doesn't require a press for the apples, and tells you how to make both sweet cider and dry. Cider is wonderful to drink, but it can also be a great way to give your house a good smell over the holidays. I love to pour a bunch in my slow cooker, add some spices, and let it bubble away with the lid off. We drink it slowly, and it makes the place smell all warm and cozy until it's gone. You can make everything from traditional mulled cider to the pumpkin spice version. OK, it sounds a little nutty, but bear with me. I found this apple cider soup a few years ago when I had leftover apple cider that we just weren't drinking (I may have gone a little overboard and made way too much). You can combine apple cider with either beef or chicken stock to make a unique and delicious soup base. Add almost anything you want to the base, and you have a fun holiday soup that everyone will gobble up. Another great way I've used cider to spice up any meal is to add it to the sauce. Making pancakes for breakfast? Put cider in the syrup. Dinner? Add it to the gravy. These are just a couple of ideas to get you started. Honestly, you can add cider to almost any sauce. Its flavor is subtle enough that it won't overwhelm the rest of your spices, but it definitely adds something special to whatever you're cooking. What is fall without chowing down on at least one really good apple crisp? When you add cider, though, it takes your everyday, amazing apple crisp to a whole different level. After all, why not make your apple crisp even apple-ier? Quinoa cooked in apple cider, sweet potatoes, more apples, and all sorts of little add-ins make this dish taste like an autumn dream. While the cider flavor may be more subtle here than in some of the other recipes I've mentioned, it's a great way to enjoy your cider and eat healthy, too! We all know that scalloped potatoes are truly spectacular as they are. Would cider really make them better? Yes. Yes, it would. These are some of the best scalloped potatoes I've ever had. There's something about adding the cider and the nutmeg that gives them an earthier taste. It's not much, but these two ingredients bring out flavors in both the potatoes and the cheeses that you just don't taste otherwise.